A Danish chef is re-imagining Mexican cuisine in the Yucatan. TULUM, Quintana Roo, Mexico — I’ve never had a meal like this, and may never taste its equal again. It was, simply put, a one-of-a-kind experience that may be impossible to repeat. So let me share it with you the only way I can: through words. The celebrated chef René Redzepi, from Copenhagen’s NOMA— a restaurant that leading food critics consider one of the world’s best — came to Tulum this spring and opened a pop-up restaurant for seven weeks. (Previously Redzepi had opened pop-ups in Sydney and Tokyo.) Last December, he offered 7,000 reservations to NOMA Mexico at $600 each. All of them were snatched up within two hours. The stakes were as high as the price tag. Redzepi had to transform a parking lot in Tulum’s tourist zone into a laboratory of gastronomic experimentation. Understandably, he didn’t come to Mexico alone — he brought along his family and about 100 employees from NOMA in Copenhagen. 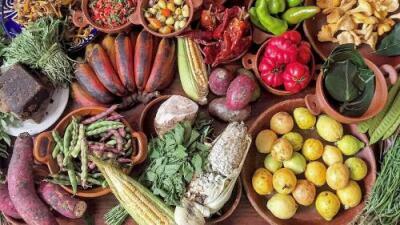 Redzepi and his assistants spent months exploring the traditional dishes and ingredients of the Yucatan peninsula. They built an open kitchen and set up an outdoor dining room on the sand, under the palm trees. Then they launched a culinary revolution. This whole experiment was about reimagining Mexican cuisine — tasting Mexico in a whole new way: What sort of experience could a renowned foreign chef create while using the local ingredients available to Mexicans? The result was truly an epiphany. Redzepi and his team tasted the same food I grew up with in Mexico, but they saw it with a fresh perspective. They deconstructed it, rethought it and reassembled it precisely. In the process they introduced us to new sensations. For instance, Redzepi served a lot of flowers, in soup and as an entrée. Before that meal, I had only seen those flowers used as décor. After that first course, I gobbled up a “salbute” (or puffed tortilla) with grasshoppers, and a seaweed dish infused with “michelada” (a beer-based cocktail). I tried a ceviche prepared with broiled, marinated bananas. I had never tasted a softer octopus than Redzepi’s “dzikilpak,” cooked for hours in maize dough inside a clay vase. When a dish featuring “escamoles,” or ant eggs, arrived, my five dinner companions were a little intimidated. But the dish, whose history stretches back to Mexico’s pre-Columbian times, was a delight — served on a tostada and surrounded by miniature local greens. I ate young coconut with a pulp as soft as jelly, transformed into a tropical-Nordic hybrid with a garnish of Scandinavian caviar that Redzepi brought to Mexico. A black mole sauce, traditionally served with chicken, was placed upon a baked “hoja santa,” a large-leafed Mexican herb. More recognizable were small tacos of “bald pig,” a mix of crunchy and soft pork — a tribute to “cochinita pibil,” a slow-roasted pork dish. For dessert, we were served grilled avocado ice cream and chocolate with chile. I’m no food critic, and after three surgeries on my nose, I have little sense of smell. But each of those delightful dishes had its own unique, complex story that could be experienced by all the senses. We diners could hear enthusiastic cheers from the kitchen every time a dish was served. Four Yucatecan women were making tortillas by hand. The restaurant’s young servers, aware that they were part of something special, were meticulous in their description of the dishes — a sign that they loved the food. I happened to be there for the last supper — the night that NOMA was closing its doors in Tulum. Once the final dessert was brought out of the kitchen, toasts and laughter followed. “We did it,” said Redzepi. In the end, Mexico demonstrated that it was the best country in the world for this great experiment. With the same foods available to everyone, these foreigners were able to create something entirely different. When they speak about México, they aren’t thinking of mass graves, election rigging, spying or corruption. No, they think of endless possibilities and resources — a joyful, almost magical place with solidarity and “the prettiest service in the world,” as an American hotelier put it.